Chakra comes from the Sanskrit word, चक्रम् cakram, which means wheel. 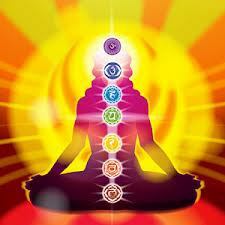 The chakras are energy centers or wheels where energy, also known as prana, chi, or qi, rotates and flows. Anatomically, the chakras correspond to the locations of major plexuses of the nervous and circulatory systems. Here I will introduce three ways to bring balance, harmony, and healing to the chakras. Though some of you may recognize this from chanting mantra in your yoga practice, here is a chakra vibration meditation practice for the seven main chakras that run from the base of the spine up to the top of the head. You can do this chakra vibration meditation practice seated comfortably in a chair, sitting in meditation, or lying in Shavasana (corpse pose). Sit or lie quietly for a few minutes before beginning. When ready, chant the following vibrational sounds, or mantras, for each of the seven chakras. You may choose to chant each mantra once, or a certain number of times (3, 9, 27, 54, 108… ). You could also do a continuous chant, cycling through all the chakras from bottom to top repeatedly. Doing this chakra vibration meditation practice can help clear out any stagnant energy in your chakra centers, revitalize weak chakras, and bring your energy into balance and harmony. If you feel a certain chakra or corresponding area of your body needs healing, you could also focus on the mantra for that particular chakra. Another way to promote the flow of prana (chi, qi, energy) and bring the energy flow into balance and harmony is with the use of gemstones. In a chakra gemstone meditation practice you can use a gemstone for each chakra, or focus on a specific one that needs attention or healing. Gemstones can purify/cleanse, promote healing, harmonize imbalanced prana, and facilitate the flow of energy through all the chakras. A chakra gemstone meditation practice is best done lying down since you will need to place the gemstone(s) on the chakra(s). Make sure you are comfortable and warm, whether you are lying in shavasana on your yoga mat or on your bed. With the gemstone(s) on the chakra(s) rest in meditation: Shamatha calming the mind meditiaion, Vipassana mindfulness breathing, or a visualization practice on the chakra(s). You could also chant the chakra vibration meditation practice discussed above. We can also do chakra balancing and healing with nutrition. We can bring our prana (chi, qi, energy) into balance and harmony, and promote healing for the chakras and their corresponding areas of the body and mind with the aide of foods. Whole, fresh, and organic foods can be potent medicines and healing tools. 1) Muladhara – Root Chakra: Non-meat proteins: kidney and aduki beans, legumes, nuts; red fruits and berries, beets. 2) Svadhisthana – Naval/Sacral Chakra: Liquids/fluids, oranges, carrots, pumpkin. 3) Manipura – Solar Plexus: Whole grains: oats, barley, quinoa, wheat; bananas, lemons, sunburst squash. 4) Anahata – Heart Chakra: All green and leafy vegetables, kiwi, spirulina, zucchini. 5) Vishuddha – Throat Chakra: Blue and purple berries: blueberries, blackberries, lingonberries. 6) Ajna – Third Eye Chakra: Any purple or violet fruits and veggies: purple cabbage, broccoli, potatoes, asparagus, eggplant. 7) Sahasrara – Crown Chakra: This chakra is usually associated with water and fasting. This entry was posted in Health & Healing, Yoga and tagged balance & harmony, chakras, chi, gemstones, healing, mantra, meditation, nutrition, prana, vibrations. Bookmark the permalink. I used to do that chant many years ago and forgot it. So glad to have it back. Also delighted with the gem stone cleansing. I have many in my home, but don’t really understand how best to use them so will definitely make use of these. Thank you, my friend. Thanks for posting this, really good reference and right to the point. Sometimes I feel like I have to search so many sources to put together the various gemstones and mantras. Very helpful. Interesting, I never heard of associating food with the chakras. It’s also good to cleanse your gemstones regularly. Reblogged this on the art of life. Thanks for visiting my blog. I absolutely love your posts. Apart from the main beej mantras of the chakras, there are mantras for each of the petals of the chakra as well which enable chakra dharana. These sounds make up the Sanskrit alphabet.